Memories like this are powerful, they transport us places. And Place is powerful too - our environment shapes who we are, creates opportunities to meet people and form new memories and experiences. Slottsholmen is an exciting new project combining built form & urban design, with publishing, identity and typeface design, all these stanza come together to tell stories and create spaces as a symphony (or perhaps more appropriately a pop hit!). With Slottsholmen ABBA's Björn goes back to his roots – and shares his life stories. Björn Ulvaeus grew up in the small town of Västervik in Sweden. He left it for a career in music that took him to the top of the charts and around the world. Urban memory is the mark that his roots left on Björn, as he grew and experienced new things the place he left behind evolved too. When Björn Ulvaeus was young, the island of Slottsholmen in Västervik was the place to go on weekends. "It was buzzing with people. There were Saturday and Friday dances and stuff like that” Björn remembers. "I had a vision of creating a meeting place like that again". An exercise of transformation and permanence for both the island and the man. The result is a new building on Slottsholmen with a hotel, restaurant and a marina. The identity for Slottsholmen was created by The Kind Collective in close collaboration with Björn. The logotype has a thin wavy line that is not only inspired by the location of Slottsholmen, being built on water, but is also related to sound waves in music. The wavy line can also be found in the Slottsholmen’s brass signage, stationery notepads, light fittings and outdoor bench. A particularly special feature is the Sculptural 5 meter long, heated, brass bench which serves as a meeting place or a place for contemplating and dreaming (just like Björn did). the bench is adorned with an engraved line of text "I have a dream, a song to sing"
A custom typeface was also designed by NM type for the identity. “We felt it was important to create a feeling of coming home to Björn”, The Typeface is used in all the brand applications including signage and stationary for the project. The shape grammar is subtle, delicate and modern so the type does not feel too loud or intrusive. Björn had also written a collection of stories from his childhood in the town of Västervik and from his career in music, to coincide with the opening of Slottsholmen. The book is an exquisitely conceived piece of editorial design. "Another example of reaching for the stars, but remembering your roots - from Västervik to the world". And the title? ”You are who you meet. It’s one of those things you realise as you get older. The constantly changing man that I see in the mirror every day is very much a reflection of the people I meet and have met in my life,” Björn says. The book's typography was inspired by Björn’s creative process of how he wrote his songs and plays with the use of a typewriter. - “While doing research for the project at the ABBA museum we discovered Björn’s typed out screenplays and notes with handwritten scribbles on them. They formed the direction for the book design”, says Creative Director Rickard Villard. 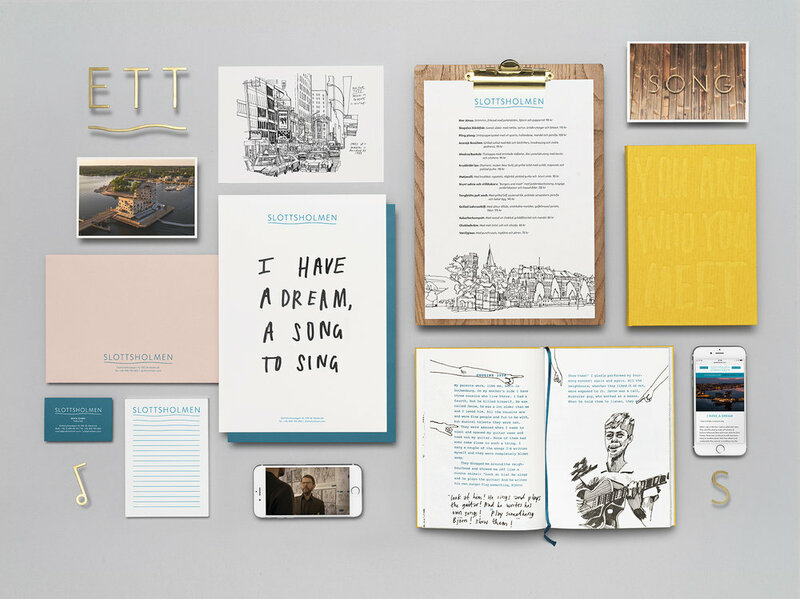 The book is currently only available to hotel guests at Slottsholmen. Although I hope it is released to the public as it is a really delightful and energetic production which would enable Björn's memories, musical journey and life narrative to be shared with a much broader audience. One of the people Björn met who helped shape this project profoundly is the artist Patrick Vale. Björn met with Patrick in his New York studio to share some of these life stories. You Are Who You Meet is a collaborative effort. ”The result of a wonderfully strange and exciting meeting of minds,” as Björn describes it. Check out this video capturing the collaboration. The dynamic illustrations and lettering are not seen as separate entities but are integrated with the stories, in order to give them life and a personal feeling. Patrick's art juxtaposes perfectly with the clean and precise nature of the identity and typeface design. So as well as helping to visualise and share Björns memories in the publication. His illustrations are used on the menu and as framed prints in the hotel and restaurant. The Baltic sea and yellow lichen from Västervik’s archipelago formed the basis of the primary colour palette, while the pink comes from the building's colour. The blue and yellow combination was inspired by Björn’s Swedish origins. Björn’s book is bound by a yellow linen cloth with a hand lettered debossed cover which reads "You Are Who You Meet". A belly band is wrapped around the journal inspired book with a seamless panoramic view from Västervik to New York. The illustration captures the idea behind the Slottsholmen concept of bringing the world home to Västervik.